I've had the privilege of knowing Brother and Sister Gregory for over a decade. And it is a special honor to write a few words about them. They have not asked me to do this. This is an assignment from the Lord. HE has commanded me to construct a web site for this ministry. And what a privilege that is. Brother Gregory's motto was, "God IS faithful!!" And the Gregorys have proved that again and again. The Lord has NEVER let them down. And their life of living faith has been an encouragement to me and many others. Brother Gregory has now gone to be with Jesus, but Sister Gregory carries on the ministry with the help of her son, daughter-in-law and grandchildren. The Gregorys are two people who turned away from the security of a regular job and even said "goodbye" to the joy of being the pastors of a beautiful church of loving people. In 1975 God called them to reach out to a group who really make this Nation go: TRUCKERS! 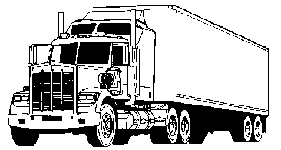 Truckers are unsong heroes. Without them we would all be nearly starving. Those men and women in truck cabs on a billion miles of highway don't get much chance to be anywhere else but on the road. And to these people Bunny and Blonnie Gregory have been chaplains, friends and loving human beings for so many years. You will want to read for yourself some of their many adventures in Blonnie's "A Funny Thing Happened On the Way to Heaven" series, and in Chaplain Bunny's "Trucking For A Miracle Working God". 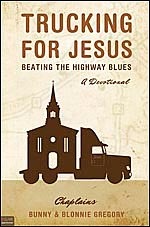 Also Chaplain Blonnie has a work out called, "Joy For The Journey" and a new book entitled: "TRUCKING FOR JESUS". You will find links on the left to these works and to all the various pages on this site. Because of their wonderful personality, their warm music and their heart for hurting people they are often asked by churches along the way to come and minister. Also they have ministered in prisions. They are so determined to touch lives that they did not celebrate Christmas in their own home for over 30 years! Instead they spent Christmas in a truck stop 3,000 miles from home!! Oh yes, that's their Mobile Chapel in the center above, a "converted" 18 wheeler they call Sheneeda. I'll let Blonnie tell you why they call their truck Sheneeda. You will discover that secret in her books on the left side bar. In their truck you won't find any pallets or crates. When you walk through the back door you find yourself in a house of worship. There are pews, a pulpit, lovely fixtures and an atmosphere of PEACE. The trailer is a chapel on wheels! Thousands of truckers have walked up the portable steps in the back to worship, find Christ, and get heavenly help of all kinds. The Gregorys traveled from coast to coast, truck stop to truck stop on a route that, through the years, has been opened to them by the Lord.